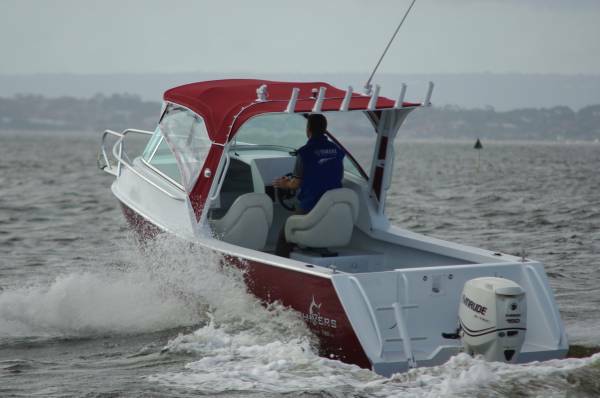 The aluminium Chivers 190 Thresher hull has been around for some time in centre console and runabout form, which has suited the majority of buyers who want a fishing machine. But for those who take small children out with them there were shortcomings: the kids wanted to go home before the anglers did. What a cabin can do is extend the fishing day by an hour or more. When the kids are tired of not catching a fish they can play in there with Nintendos, or watch a portable DVD player. And on the way home they can fall asleep, eliminating the refrain of ‘Are we nearly there yet?’ And, of course, a cabin is handy in its own right for storage and shelter. Hence the Thresher Fore Cab. 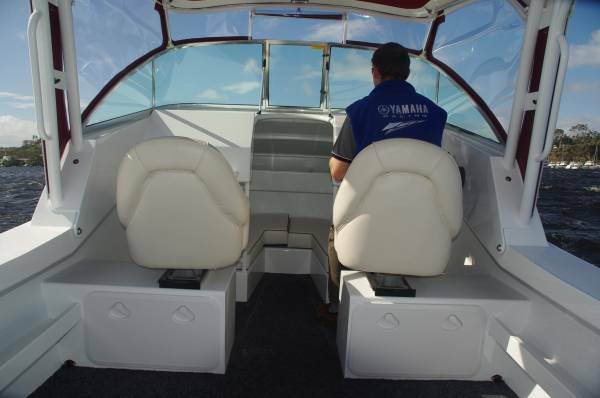 The cabin is sited well forward to maximize the cockpit, and is quite short for the same reason. There is no pretence of its being an adult sleeping space: it contains a well upholstered U-shaped settee over storage bins, and has a deep oddments shelf across the forward bulkhead. Importantly, it has good sitting headroom. A rear bulkhead would have created gloom, and its absence also gives good footrests on the settee-end rails. 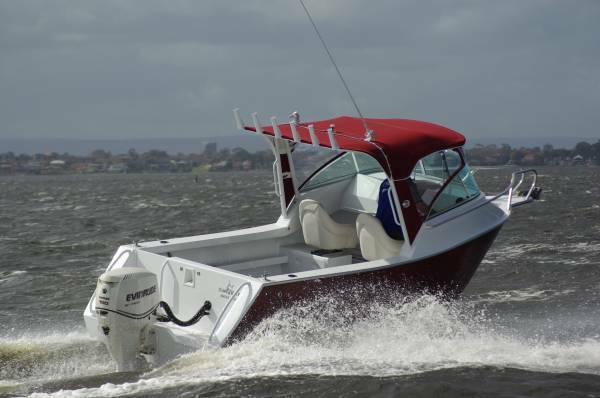 A runabout-style opening windscreen gives access to the foredeck and anchor, a rounded recess in the dash easing the stretch of anyone leaning through. The review was the maiden voyage of this prototype, and it showed up just one flaw: a poor view ahead when sitting. The seats had lifting bolsters so this was no disaster from the lookout point of view, but first stop after retrieving the Thresher was the factory, where extended pedestals would be fitted under the seat swivels. The pedestals are mounted on locker boxes that extend right out to the sides: such an obvious use of otherwise wasted space. We had the right kind of day for testing a hull meant to cope with poor conditions. Our conditions were so extravagantly poor, courtesy of a 35-knot northwester, that we chose the river instead of the ocean. We still had plenty of roughness, but the short and steep seas gave us something different to contend with. The Thresher coped just fine. The 20-degree deadrise bottom soaked up what would otherwise have been a jolting ride. As with many good hulls, a little more speed rather than a little less often improved things. At times, downwind, our 150hp ETEC took us to 37 knots. The hull, with its immense quantity of stiffening, kept itself quiet, producing no resonance at all. At rest, the flooding keel did an excellent ballasting job in the conditions, and would have allowed the two of us to fish a rail with acceptable comfort. The windage of the cabin suggested a sea anchor could be a useful accessory on the more rugged days. Fishermen are structurally well catered for in the Thresher. Under the carpeted deck the longitudinal framing makes natural tank cavities, and two large fore and aft catch tanks use some of the space. A usefully large 180L fuel tank also fits in. Up top the Targa, which extends well aft, carries a bank of rod sockets on its rear edge, complementing the coaming sockets. The Targa folds, but if you intend parking under a carport it could be worth getting out the tape measure because the windscreen top remains fairly high. The Bimini the structure supports covers plenty of area and comes with neat clears - whose water tightness we proved practically. The many models in the Chivers Shark range share an unusually consistent theme. Ideas that work in one find places in others, and the boats have a well integrated feel to them: they appear not to have add-ons. The side pockets, for instance, are hull stiffeners and steps as well as being containers. And, because it can, the starboard pocket extends across the transom as far as the midships seat box. Which, incidentally, contains twin batteries – a great standard safety measure. 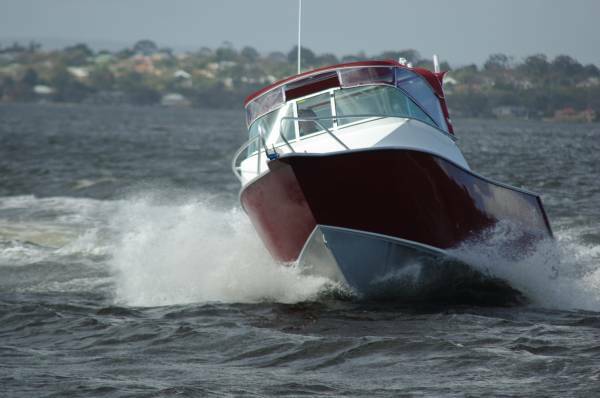 A couple of other good standard ideas: a fuel filler recessed into the transom above the motor well, meaning spills do not enter the boat; all areas subject to abrasion – rails, gunwales, rims of wells, pads of bollards and cleats – are free of paint. On the subject of paint, the Thresher’s hull and upper works have been coated exceptionally well. This is due as much to the fairness of the metalwork as it is to preparation and spraying technique. There was not a particle of filler used on the Thresher, not even any coving under the rubbing strake, and it did not need any. Compare this with a super-yacht whose bog and paint job costs more than the metalwork.